National University (NU) is dedicated and committed to contributing to human resource development through innovation, research and technological advancement in order to serve the community. The interaction and linkage with industries and professional bodies extends to human intellectual reach and is a key to Oman’s competitiveness, innovation and economic development. To make engineering education holistic and more relevant to the societal and industrial needs, students from technical institutions need to be offered training in industry to give them first hand practical exposure in addition to the theoretical themes they receive at the college. The Placement and Training Centre (PTC) at College of Engineering aims to facilitate the process of student migration from the institution to industry and to continue the individual’s education and build strong collaboration with local and regional industries to enhance employability. The PTC is established within the College of Engineering campus in order to support students to find placement and training in industry and other organisations to enhance their attributes and gain exposure to the practical world. The PTC has the objective of accomplishing above 90% graduate employment in future in line with the college’s vision and mission. The PTC plays an integral part in shaping the careers of the students of CE and its approach to the placement & training includes, (a) exchange of ideas and experiences with industry for the continuous improvement of the learning and teaching process (b) create a professional global network for faculty, students, graduates and experts from industry and commerce (c) career guidance and placement (d) summer training and internship. To be a leading training provider in the field of engineering and management that promotes professional excellence. To provide training and development that contributes to the professional development of individuals, society and corporates in the field of engineering and management. To provide employees with professional and educational training. To identify the need of industry and deliver a custom-made formative courses. To act as a centre of offering certified professional courses as means of continuing education and training. To develop and encourage integration of training into the workplace through short courses. To provide value addition courses to graduates for enhancing employability. To provide cost effective solutions to industries in the area of technological problems and in applied research. PTC has a wide range of experience in providing quality customized training solutions for its corporate clients specializing in the design, development, delivery and management of workplace specific training solutions. We take pride in our expertise to provide professional training programmes with course content and facilities to fulfill the requirements of corporate clients & industries. Our team of highly qualified professionals has wealth of experience in delivering courses to wide range of clients such as OMIFCO, Oman Gas Company, Galfar Construction and Contracting Companies, Arabian Industries, Ministry of Defence, RCA and Ministry of Education, among others. 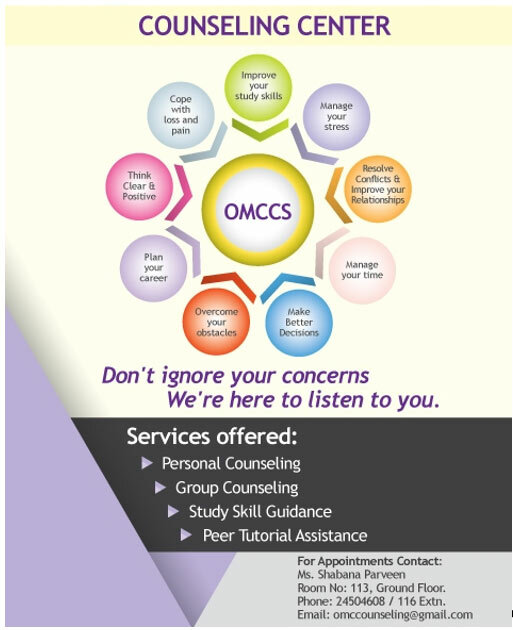 The counseling center operating at these campuses provides confidential, free guidance and career path services for all registered students.